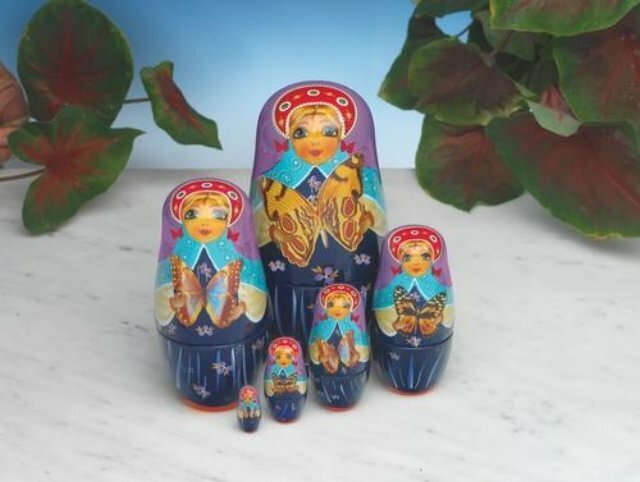 Our newest introduction to our collection of nesting dolls is now crafted in fine porcelain ceramic. Each beautifully illustrated doll is high temperature fired, producing vibrant color, distinctive detail and high gloss finish. Each of the six figures carries a unique butterfly and is illustrated with butterfly inspired patterns. An enchanting keepsake to display or give as a one-of-a-kind gift. Largest doll measures 7" tall.